I have updated this document to include styling information for Internet Explorer 10. Screenshots of HTML5 progress bars with different styles applied. Details given below. As a web application developer, progress bars are great when you want to show the user that some action is happening, especially when it can take a long time. They can be animated (like the one in Gmail does when it shows the user how long it is going to take for it to load and initialize), or static (like some shopping cart applications have to show the user how many pages it will take to check out an order). I used to create progress bars using <div> tags, CSS and a litle bit of math, but now I like to do it the HTML5 way using the <progress> tag. This article will discuss how this tag is rendered by default in all operating systems and browsers and how to style the progress tag with CSS, even in browsers that don’t officially support the it. It will also discuss some interesting limitations of all the browser implementations amd show some interesting examples using advanced CSS3 techniques. Firefox and Chrome will render the progress bar the same way that the host operating system would … except for Chrome for Linux, which uses it’s own custom style (thanks to Mounir Lamouri for correcting me on this exception). The color of the Opera progress value is always green (more on this later). A progress bar can also have an “indeterminate” state, which happens when there is no value attribute. This effect is used to show that the state of progress is currently unknown (e.g. how long it will take for a web server to initiate the download of a file if is generating it on the fly). How this looks varies from browser to browser as well. Opera is the only browser that doesn’t distinguish between a progress bar with an indeterminate state and one with a value of zero. All of the other browsers (including the ones that use the polyfill) animate the indeterminate states. (I have opted to not show all the animations here to avoid readers getting seizures … I hear that would be a bad thing). One changes the value of the progress bar by changing its DOM node’s .value property. Easy peasy. But I Want To Style Them My Way! Simple stuff: remove the border and add a specific width and height. I added the second rule to remove the background image inserted by the polyfill’s stylesheet, but if you wanted, you can modify the polyfill’s stylesheet directly (or leave it out completely if you elect not to use the polyfill). The final rule is to ensure the polyfill doesn’t display the fallback content — it assumes that is always wrapped in a <strong> tag, so this may be something you should keep in mind when setting the default content (if you don’t like using a <strong> tag as a wrapper for your fallback content, use whatever tag you like). Note that the appearance property (and its vendor-specific brethren) are there to turn off the default operating-system styling on the progress bar — it doesn’t seem like it is really necessary, but I put it here for reference in case it becomes mandatory in the future. 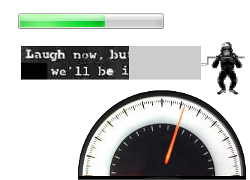 Step 2: The Progress Bar Background. Now let’s change the background color of the progress bar to a light red. Notice that with Firefox and the polyfilled browsers, all you need to do is change the background of just the progress tag itself, while in Chrome (and I assume future versions of Safari) it is necessary to use the -webkit-progress-bar pseudo-element. Note that even though the code inside these rules are the same, you cannot put all of these selectors in one rule: doing so breaks Firefox and Opera (so much for degrading gracefully). Unfortunately, this example doesn’t work in Opera and IE10, since at this time one cannot style the progress bar value with an image in those browsers. This example doesn’t work in any version of IE (since that browser can only change the color, not the background image, of a progress bar value) or Opera (since it can’t style the progress bar at all). Also, note that I did not use the Gradient filter to polyfill CSS3 gradients in IE6-9. This is because Visual Filters don’t work in CSS3 pseudo-elements like :before or :after. Oh well. What blog post about HTML5 progress tags would be complete without monkeys? These simians appear in all browser except for IE8 and lower (as explained below). Apologies to the great Banksy — it’s not his monkey but one grabbed from this Animated GIF site and converted into a CSS sprite using André Gil’s super-cool Gif2TileSet tool. I took this sprite and animated the monkey using blitting whenever the progress bar changes values (thanks to my friend and colleague Noel Tibbles for turning me on to this technique). I wish that I could have used :after (or ::after) rules instead, but these pseudo-elements don’t work with the progress tags in any browser that doesn’t use the polyfill. And no, :before doesn’t work either. I have no idea why it doesn’t work, but it’s a shame — using them would be perfect to get rid of the extra markup. Each of these rules are applied when the first digit changes in the progress bar, which is done using the ^= attribute rules. This works because the progress bar goes from 0 – 100 and the progress bar increments by 10. They monkeys don’t appear in IE8 and under because of it’s lack of support of the ^= attribute selector (but it works well in IE9). * Don't try this - it doesn't work in any browser, but it would be nice if it did. Hopefully this will come to pass in the future. The CSS is similar to the monkey example in that I add an extra <div> after the progress tag, except that it has an image of a pointer inside of it. You cannot use :before/::before or :after/::after pseudo-elements on the progress element. Why this is not allowed is unclear to me, and I hope this is allowed in the future. Safari 5.0 and lower cannot use the polyfill, so you should always use the fallback HTML inside the <progress> tag. It seems like it is impossible to change Opera’s progress bar value style to anything besides green. While you can change the progress bar value color in IE10, as far as I know it is impossible to apply a background image to it. There is a small bug in the polyfill when applying borders to the progress bar. I have a fix that has been submitted as a pull request and I assume being reviewed, but in the meantime, you can get my forked version of the polyfill (with the bug fix) on GitHub. Help Me Keep This Page Up-To-Date! It would be nice if select and input files actually have a similar selectors to customize them like that. This is indeed an excellent, in-depth article. Thanks for taking the time to explain this so fully! Superb :) Filled in a few blanks but like to see it out there! The one with gradients are promising! Thanks for sharing this information. The summary of gotchas is nice. The second gotcha, about Safari 5.0 seems to have something missing. If I have followed correctly, I think you meant to point out that with Safari 5.0 and lower you should always use the fallback markup. If I haven’t followed correctly, I’ll blame my lack of coffee this morning! I bookmarked this page and hope it will help me in the future, to rebuild my project! This is really cool! I’m lovin’ HTML5. Thanks for the write up. Awesome stuff Zoltan. I definitely will go back to this when I have a project that needs it. Thank you!! that is really cool, nice post! Thank you! I liked the article would use some of this in future website but with better design! Thanks for sharing. Thanks for the highly useful info! I’m impressed at Opera’s consistency across OS in the default bars – and I love the speedometer example. This is so much awesome on the simplicity. This looks great – i have been really getting into HTML5 but obviously not enough as i didnt even realise this existed! I would love to implement this as a page / image preloader – can anyone provide a simple example or link to this? @Jason: Take a look at my new blog post for an image preloader example. ::before and ::after do not work cause they are create _inside_ the PROGRESS element. And content of this element is replaced with a progress bar. The same goes for the OBJECT element. That is what I call ‘progress’, HTML5 will rock the internet! Using it vertically, is it possible? And using multiple color? 0% = red 100%=green ? @Jo: Yes, both are possible. Stack Overflow has a great discussion on vertical progress bars (or you can just use CSS3 transforms to turn the progress 90 degrees if you are feeling very lazy). As for the multiple color issue, I am assuming that you mean that the bar will be red at 0% and as the number approaches 100%, the hue of the progress bar will change gradually to green. If that is the case, you can use a variation of the attribute selectors used in the monkey example to do this. I will, however, leave it as an exercise for the reader to implement it (or until I have a few cycles to actually do this myself). Excelent post thank you very much! It was mind blowing, thanks. one of the best tutorials I have ever seen. Whats the code for the button Test Progress Bar? In general, if you want to change the value of a progress bar DOM element, you simply set the .value property of the object. You can see the exact code the blog post uses if you’d like. I just want to test the comment box.It’s beautiful. Awesome article, too content of the web site!